Abe’s new Cabinet will signal his priorities for Japan after winning reelection as LDP president. After winning reelection unopposed as president of the ruling Liberal Democratic Party (LDP), and therefore keeping the premiership in Japan’s parliamentary system, Japanese Prime Minister Shinzo Abe is expected to reshuffle his Cabinet as well as the LDP’s executive team in early October. By looking at who he intends to keep, based on hints dropped in early September, we can glean insight into what agenda items Abe plans to prioritize and how he hopes to maintain popularity after a contentious September. The new security bills are dear to Abe’s heart, but getting them through Japan’s legislature took their toll on public support of his leadership. A cavalier view of his reelection – the only challenger, Seiko Noda, could not even muster the 20 backers necessary to throw her hat in the ring – would suggest that Abe has a free rein to continue his high-handed approach. However, Abe is shrewd enough to know that now is the time for some major damage control. Starting in October, Abe’s focus will shift back to the economy, the issue that brought him back onto the stage of national politics in December 2012. When he was reelected, Abe announced, “With Abenomics being halfway along the road, I would like to fulfill my responsibility by producing results.” He vowed to prioritize fighting deflation, promoting growth, and accelerating reconstruction in regions affected by the March 11, 2011 triple disaster. As such, members of the leadership focused on economic revitalization are expected to stay on, in order to ensure continuity of Abe’s favored policies. Keeping them in their positions also makes political sense, as they are some of Abe’s closest supporters. This group includes Finance Minister Taro Aso, Economy Minister Akira Amari, and Cabinet Secretary Yoshihide Suga. Within the LDP leadership, Abe is likely to keep Sadakazu Tanigaki and Toshihiro Nikai as secretary-general and chairman of the General Council. Tanigaki and Nikai have served in their positions since the reshuffle last year; both were chosen to complement Abe’s weaknesses. Tanigaki is known as a fiscally conservative, liberal dove, which can offset Abe’s free-spending, hawkish image, and Nikai’s experience and personal relationships bring a pro-China tilt to the leadership. But true to Japanese political form, Abe is also likely to retain a potential rival, Shigeru Ishiba, who is currently in charge of revitalizing local economies, though it is unclear yet whether he will keep the post or be reassigned. Abe defeated Ishiba in the September 2012 party leadership race, but Ishiba’s popularity – which makes him threatening to Abe – is also expected to help the party in the Upper House elections next summer. Immediately after Abe defeated him, Abe appointed Ishiba party secretary-general, granting him a powerful position but reuniting the LDP in the process. Last August, Tobias Harris argued that Abe tried to neutralize Ishiba by making him minister in charge of changing the national security legislation in order to enable Japan to exercise collective self-defense. Ishiba would have been the public face of an unpopular policy and would have been kept extremely busy. Ishiba turned the offer down, and so Abe made him minister of rural revitalization – a win for Ishiba, as the position offers a lot of positive visibility with low risk of failure. Ishiba spoke of forming his own faction recently, saying, “The word faction may sound negative, but I feel a responsibility to set up a group centered on policy-making.” Understanding Japanese politics, with their weak parties, really requires an understanding of faction dynamics. For example, Abe was able to secure his reelection because he had the backing of all seven of the LDP’s factions, while Noda had none. So Ishiba potentially forming his own faction is an important development to keep an eye on. Abe’s three-year term will expire in 2018, and he cannot run for a third time in a row. Therefore, Abe is looking to prepare his preferred successor, Tomomi Inada. In the Cabinet reshuffle last year, Inada was appointed LDP’s policy chief. Despite her youth, she has been favored by Abe because they share similar views on security policies and historical issues: she regularly visits the Yasukuni Shrine and is known for her opposition to giving local election rights to permanent foreign residents. Inada recently gained popularity (or notoriety, depending on your views) for her strong performance on NHK’s televised debate defending the controversial security legislation. Abe’s strong backing and Inada’s own shrewd politicking could lead her to becoming Japan’s first female prime minister. In short, don’t expect too many upsets in the October reshuffle. Continuity will be emphasized, especially in the economic realm. With the Upper House election next summer, the LDP needs to present a united front. 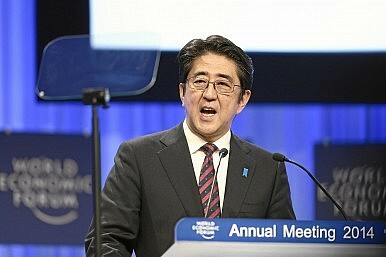 However, there is a potential Achilles’ heel that Abe needs to be wary of. His unopposed reelection also poses a challenge, as he must appease all the factions that backed him. In fact, one of his greatest challenges when he was first prime minister between 2006 and 2007 was that he was too popular. After Koizumi’s lone-wolf style, all the factions were eager to jump on the bandwagon and support Abe, Koizumi’s heir, so that they could share in the spoils. This limited Abe’s ability to make personnel decisions. As all factions support Abe, there will be greater demands placed on him by other party members to reward them for their loyalty.